In the time between the public announcement of the Sprint at the 1970 October Earls Court Motor Show and the official launch of the car in February 1971, there was frantic activity at the factory. With sales of the S4 all but tailing off and a motoring public eager for a more powerful Elan, dealers were badgering Lotus to get the Sprint out. Tony Rudd, Engineering Director at Lotus at this time, claimed responsibility for reworking or “freshening” the stock of “unsaleable” cars by proposing painting the bottom of Elans white, an area where there had been paint and body defects, as well as fitting the new engines. Graham Arnold attributed the plan to Fred Bushell, even stating that he became known as "Retrofred" by Colin Chapman as he was always retro fitting parts to cars or updating them to a later model. Arnold says that the order came down to retro-fit "the few" unsold S4s at the factory, but that nobody adjusted the records. A small number of SE S4s were thus converted to Sprint specification by the factory. These would appear to be from cars parked up at Hethel awaiting despatch to dealers. It is also possible some of the more vocal dealers returned their dormant SE S4s to the factory for conversion. Rudd also indicated that once the Sprint had been relaunched in February 1971, Lotus was selling 35 new Big Valve Sprints and 25 reworked S4/Sprints a week, though I suspect that this must have been one particular week unlike most others! 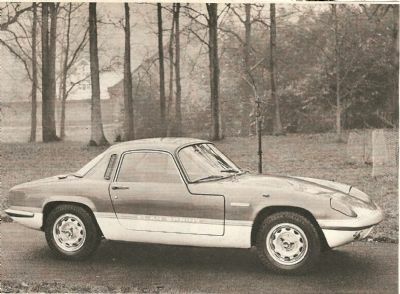 In fact, Rudd was applying his efforts to the Plus 2S Elan as well, so may have meant to include them in this number. Certainly from the VIN records I have there was no reasoning behind the selection of which S4 cars were converted. For example, the earliest such conversion I am aware of took place on an S4 that first came off the production line in January 1970. Strictly speaking, therefore, it can be argued that these cars are not Sprints and for the sake of clarity I have called them S4/Sprints. In a letter dated in March 1992, the then Lotus archivist Michael Pomfret said that 79 S4s were converted to Sprint specification in early 1971, the last on 27th March. I have details of over 70 of these and therefore make the assumption that 79 is a true reflection of the number converted. One was the press demonstrator tested by Autocar in June 1971, AVF 444J. This car came off the production line as an S4 in December 1970 and Autocar called it the prototype. It may well have been so, though it is interesting to note that it is an F type S4 SE for export model, though clearly RHD. Another S4 was pulled from the factory new car park, having been manufactured in March 1970, converted to Sprint specification and then registered for the road in August 1971, as confirmed by the factory. A still current original owner placed an order for an S4 in late 1970 and took delivery of the kit in late January 1971 in Sprint specification. The car had been manufactured in August 1970 and was road registered in March 1971. These cars retained the ignition on the dashboard, often had the bonnet bulge and had silver painted wheels.